Make sure your HVAC technician resume fully conveys the scope of your skills and training. This sample will show you how. Position yourself for the best HVAC technician jobs by making sure your HVAC technician resume fully conveys the scope of your skills and training. 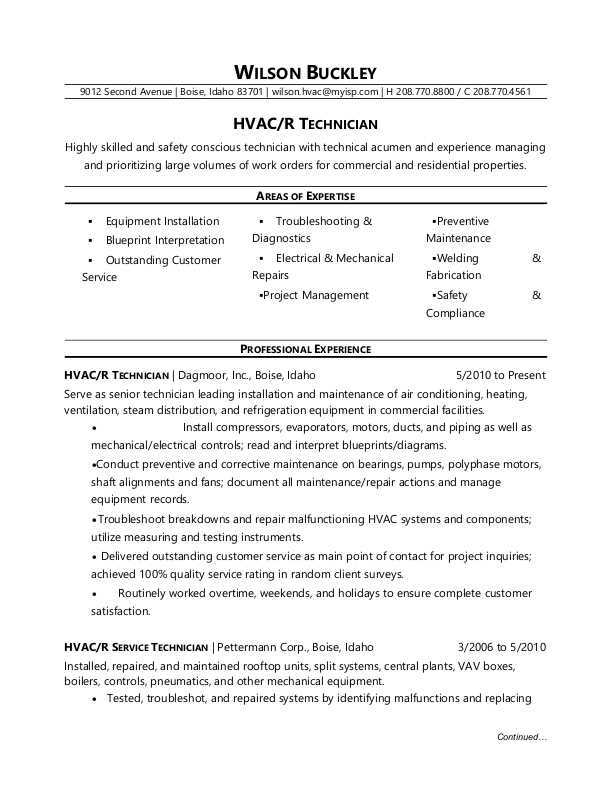 View the sample resume below, and download the sample resume for an HVAC technician in Word. Jobs for HVAC technicians are projected to grow by 15% (or 48,800 jobs) from 2016 through 2026, which is much faster than average, according to the Bureau of Labor Statistics (BLS). You'll find the highest level of employment for this job in the following states: Florida, California, Texas, New York, and Pennsylvania; and in the following metropolitan areas: New York City, Houston, Phoenix, Washington D.C., and Los Angeles. As a waitress, you can expect to earn a median wage of $47,080 per year, or $22.64 per hour, according to the BLS. Additionally, you can learn more about skilled trades careers and maintenance careers, and search for HVAC technician jobs on Monster. Highly skilled and safety conscious technician with technical acumen and experience managing and prioritizing large volumes of work orders for commercial and residential properties. Serve as senior technician leading installation and maintenance of air conditioning, heating, ventilation, steam distribution, and refrigeration equipment in commercial facilities. Install compressors, evaporators, motors, ducts, and piping as well as mechanical/electrical controls; read and interpret blueprints/diagrams. Conduct preventive and corrective maintenance on bearings, pumps, polyphase motors, shaft alignments and fans; document all maintenance/repair actions and manage equipment records. Troubleshoot breakdowns and repair malfunctioning HVAC systems and components; utilize measuring and testing instruments. Delivered outstanding customer service as main point of contact for project inquiries; achieved 100% quality service rating in random client surveys. Routinely worked overtime, weekends, and holidays to ensure complete customer satisfaction. Installed, repaired, and maintained rooftop units, split systems, central plants, VAV boxes, boilers, controls, pneumatics, and other mechanical equipment. Tested, troubleshot, and repaired systems by identifying malfunctions and replacing parts and components. Read diagrams, specifications, drawings, blueprints, and schematics. Participated in numerous professional development activities to update knowledge and increase service/repair capabilities. Demonstrated exceptional time management skills; organized and prioritized high volume of work orders to ensure maximum quality and service to customers. Completed a variety of residential and light commercial projects, installing boilers, forced air equipment, gas piping, and ductwork. Assessed customer service needs; repaired and installed appropriate components. Traveled extensively throughout assigned region to provide prompt service to new and existing customers. Maintained professional customer relationships, communicating complex information to update customers on project status. Achieved high ratio of customer satisfaction and lowest rate of repeat service calls for initial installation. Served as member of team maintaining and repairing HVAC, plumbing, and electrical systems. Collaborated with licensed contractors on installation and repair services for complex building maintenance projects. Recognized for efficiency in troubleshooting, diagnosing, repairing, and performing preventative maintenance on building and facility HVAC systems. Just like buildings and infrastructure need to be inspected by professionals, so should your resume. Could you use some help with that? Get a free resume evaluation today from the experts at Monster's Resume Writing Service. You'll get detailed feedback in two business days, including a review of your resume's appearance and content, and a prediction of a recruiter's first impression. It's a quick and easy way to make sure your resume holds up under pressure and helps you secure a great new job.